The Direfrost Clan have existed since before recorded history, known for being gentle rulers in northern Eastmarch, but for having a massive disregard for witchcraft. The Clan would become well-known for their persecution of witches, as Eastmarch was riddled with them. Direfrost Keep was at one point built, serving as their ancestral home where they would live for the rest of their lives. 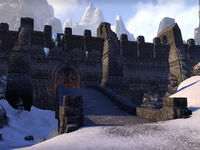 The northern winds of the Velothi Mountains are kept at bay from the Keep by the Direfrost Flame, their spiritual connection to their ancestors at Sovngarde. The Keep has always been meant to safeguard this flame from those who sought to use it. The next patriarch of the Direfrost Clan would light the flame with the Torch of Heirs. The Direfrost Clan would go on to have their reputation known across the region, slaying variously known witches and warlocks. Lorgar the Plague was beheaded at the steps of Direfrost Keep, in the attempt to challenge, Odrama Direfrost. However, the Direfrost Clan would fall to their own hubris as the witch, Drodda the Icereach was able to defeat the patriarch of the Direfrost Clan, Agomar Direfrost, and take over Direfrost Keep. All hope was seemingly lost for the Direfrost Clan as Drodda ruled over the castle for several years. However, in 2E 582, the last-living heir to Direfrost Keep, Eboric Direfrost of Falkreath sought the help of the Undaunted, and was able to defeat Drodda, and reclaim the Direfrost Keep from the elements. What became of Eboric Direfrost, or the Keep is currently unknown. This page was last modified on 22 December 2018, at 15:41.